After receiving a B.A. from Texas Wesleyan College Harry Greene served three years as an army medic, then earned a Ph.D. from the University of Tennessee, taught at UC Berkeley for two decades, and moved to Cornell in 1999. He has taught natural history of the vertebrates, non-majors intro bio, herpetology, desert ecology, and graduate field ecology, and received campus-wide teaching awards at Berkeley and Cornell as well as the Edward Osborne Naturalist Wilson Award. After decades of studying the ecology, evolution, and conservation of predators in many parts of the world, he recently became one himself, an experience that has profoundly influenced how I think about the meaning and fate of nature. 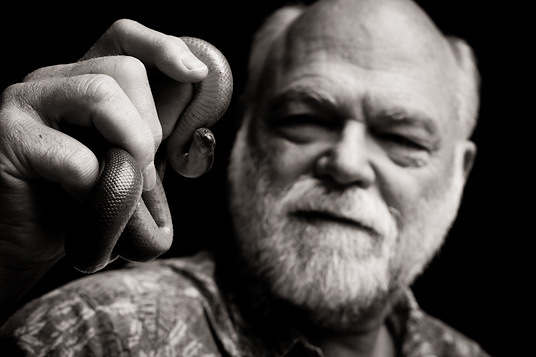 His first book, Snakes: the Evolution of Mystery in Nature, won a PEN Literary Award and made the New York Times’ “100 Most Notable Books,” and his next one, Tracks and Shadows: Field Biology as Art, is nearing completion. As a young man I was an ambulance driver, and so I used to be intimately involved in making very rapid decisions in which sometimes neither alternative was pretty, but doing nothing was horrible. And I really do believe that's where we're approaching with the state of the earth and biological diversity. You're trying to stop a severed artery and you're in the dark with a flashlight. You have the information you have, you wish you had more and you have to do something. Part of the problem is you will sometimes make mistakes in those situations. Sometimes you make mistakes as an ambulance driver, sometimes we'll make mistakes as conservation biologists, and we will be bitterly pilloried for that. But I believe that to take no action, to be afraid of the risk and take no action, is worse. It's actually kind of cowardly. It's safer, but it's cowardly.